The Vermont trout season opened on Saturday April 13th.. with warm and sunny weather. 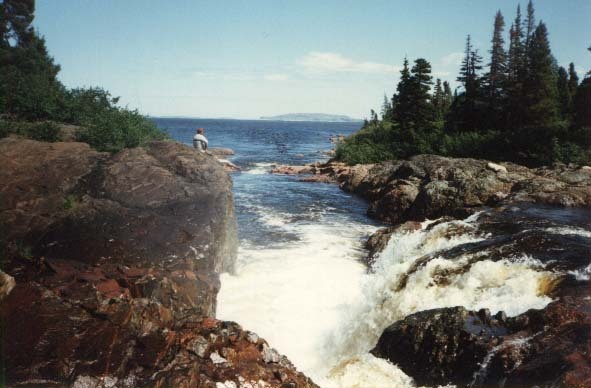 Those that fished found waters high and cold from snow melt, especially the Batten Kill. Rain events on the 7th and a major rain/snow melt event on the 14th.,sent all our area streams to flood stage or above. The Mettawee rose 2 Ft. above flood stage, the Kill over 3 Ft., and the Walloomsac just to flood stage. Water levels today as i write this report are all still too high and cold to be successful. Temps are still in the high 30's to low 40's. Our weather is getting warmer, and if we get a break on the rain events we should start to see fishing conditions next week favorable for the first time this season. I will be starting my scouting in the next day or so focusing on walking my small water targets and seeing how the winter has changed things. i haven't even wet a line yet given the conditions. My Hyde 16.5 FT Drift Boat was sold recently, its new home to a family living in northern NH. With proceeds from the sale, I purchased a 2 man Drift Boat raft from FLYCRAFT. It is 12.5 Ft. long by under 4 ft.. It weighs 98 Lbs without gear and does not need to be used with a trailer. It offers me and 1 other angler the ability to fish sections of streams/rivers that are not easily accessible due to a lack of boat launches, etc.. I will use it as a vehicle to cover water, getting out to fish the likely spots. This will benefit my older clients that find it hard to move down banks or long walks from the truck. More on how this new addition to my offerings makes out as I scout and fish out of my new STEALTH raft from FLYCRAFT. I will be selling my 16 1/2 Ft Hi-side fiberglass drift boat. The boat was extensively used in Michigan and limited use on the upper Connecticut River, and some smaller ponds in lakes/ponds in our area. I also used it on the Batten Kill but access/launch areas are primitive and result in logistic problems due to the weight/size of boat. The boat is totally outifited and in good shape. The boat was purchased new in 2004. It has both a rear anchor and front anchor mount system. Also it has a motor mount and I do have a 6 hp. long shaft Nisson 2 stroke motor that is an option to purchase. The newly refurbished trailer has 2 new tires. Any interest please e-mail me and we can discuss details and what I am asking for a price. Finally winter is beginning to lesson its grip. Overall a cooler than normal winter with some wide swings in temperature that produced very cold and snowy weather then big warmups with rain. Several of those events resulted in flooding events. The areas mountain snowpack was good and now we are seeing snow run-off from the spine of the Greens. The Taconics snow pack is all but gone and the valley locations around Manchester are all snow free, but the ground is still frozen in many areas Stream temperatures are still in the upper 30's and I have seen no fly activuty of yet, not even the first of the midge hatches. I will keep you posted on water conditions as we get closer to the season opener on Saturday April 13th. I wanted to give you an update of my report since the last river report of September 9th. Low and warm water conditions continued till mid-month when we finally got some rain events. 2 small rain events (Sept.8th. and 12th.) had virtuually no effect on flows. We did get a nice rain event on the 16th. that raised all our area streams and when levels stabilized flows were more normal for this time of year. Other events on the 26th. and October 1st. helped as well. Hatches were the typical fall variety of May Fly species including Isonychia (size 12) and the last of the Tricos (size 24) earlier in September. 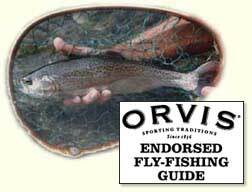 Blue Wing Olives (Baetis) (size 20) and some White flies (size 10-12) for the rest of the month. Caddis species areound are our October Caddis (size 12)and fall Cream/Ginger (size 14-16). Hatches were sporadic all month which has been the pattern of all year. Fishing was clearly after the rain events. With better flows I revisited small water that due to the very low water conditions in summer I had not targeted since late June. They fished quite well, with some very good dry fly action when water levels were optimum. Water temps are now back into the low to mid-fifties, that is excellent and the fish are more active. I will be going on my annual Atlantic Salmon trip to Nova Scotia around mid-month. I always look forward to that special week in a beautiful spot on Cape Breton Island. I will keep you posted after my return on the 25th. I just pulled off I-91 in Lyndonville, VT after fishing all day on the Clyde River in northern Vermont. As I wait for my pizza i thought I would make some notes of my day and I bask in the glow of a great fishing day. The Clyde is a small steep gradient river, a tributary to Lake Memphremagog in north central VT near the Canadian border. It has a diverse fishery population from many warm water species to cold water species namely Rainbows and Landlocked Atlantic Salmon.The lake has excellent forage for the trout and Salmon and the fish can reach impressive sizes while in the lake. In the fall the Landlocked Salmon move into the Clyde for their spawning run. It is a late September, well into October event dependent on water conditions, temperature, and decreasing photoperiod All are favorable for migratiion. My close friend Alan Erdossy, one of my Margaree fishing companions, had been wanting me to come to the Clyde and experience this exciting fishery. We took a chance after watching the radar in northern VT and determining they were getting rain. Alan fished the afternoon of the 25th. and i joined him at dusk to fish the following morning. The evening report was no fished hooked but a few were showing in the pool. that It is important because it is one of the first holding lies above the lake. Because very few fish had entered to date there was virtually no fishing pressure as well. In the morning the water level had rose only slightly as we began fishing. Alan took the tail of the pool, and I the top where a rapid entered into the head and mid portion of the pool. I was fishing a pair of wet flies, a Hare's Ear nymph with a trailer of a soft hackle about 18 " below the lead fly. The first Salmon took at the hinge point where the rig went from a dead drift to a swing. A nice 3 to 3 1/2 lb. female, silver and bright fresh from Lake. Alan hooked several and I had the luck of hooking 3 and landing 2 for the day. Timing was everything... also just plain luck!!! It was a nice get away and a possible offering to my guests in the future. I will keep you posted! Just got back from our yearly vacation to the Jersey Shore. Excellent beach weather and quite hot for the week following Labor Day. Since my last report rain events have lessened in intensitity and long times between events. Water levels have dropped to more late summer flows with the Walloomsac at about 100 CFS, the Kill at 100-200 CFS and the Mettawee at 40-60 CFS. I have been both fishing in mornngs and afternoons /evenings, especially as we get towards mid month. i will report later in the month as we get into our prime fall fishing time. Since my last report the wetter conditions have prevaled. Though the temperatres have been quite hot between rain events, showers, thunderstorms, and soaking rains have kept water conditions good to excellent. With proper timing I was able to fish some small water targets that I have not been on since June. Rain events on the 4th., 5th., and 10th all helped raised the levels on all of our area streams to median flows or above for this time of year! Morning hatches of Tricos on the upper Kill and the Mettawee are getting going in full swing. On the Walloomsac there is not much of a ( Trico)hatch lately, quite sporadic. This has been the case since 2012, the year of Tropical Storm Irene. Just saw my first Isonychia nymph cases on the rocks so that has started. Hatches for me have been sporadic, so on larger watersheds its a mix of wet fly swing and some morning dry fly action. Thats all I have at this time and will file a report some time in early September. Since the 23rd of this month our weather pattern has changed and we are getting showers, actual rain events and cooler weather. Rain events on the 19th.,24th., 27th. and the 29th. have raised all area streams way above median flows and are now settling down to slightly above median levels. Water temps. have dropped as well and is helping alleviate the stress the fish were having earlier in the month. Today I had the chance to fish myself and I sampled a small water target that finally had good flow to fish. It fished very well and I sure enjoyed the time just fishing. I caught 4 year classes the largest a 14 " Brown trout. Tricos are on for both the Vt. side of the Batten Kill and Mettawee river. Fish are just beginning to respond with some spinner falls happening. now. I am seeing some Caddis and a few very small BWO'S while morning fishing. With the improved water levels and temps., hope the fish once agian begin to spread out from the loww water pols and habitat they have been in. Finished an evening trip on the Sac today and though it was hot and sunny when we started, once we got near dusk, the bugs started and the fish reponded.! Though I was targeting stocked fish, they have had lots of pressure, and are beginning to get sophisticated and the presentation needs to be correct. Since my last report our streams continued to get lower due to the beautiful bluebird weather we have been having and very little rain. Stream flows are averaging 40-60 % of median flows for this time of year. The rain events we have had on the 24th.,28th. and July 7th. raised levels near median flows only to return to the low conditions. Water temps have been o.k., but I am only fishing mornings and keeping my stream thermometer handy. Small water targets except for the Roaring Branch have been unfishable due to low water. I am finding the stocked trout fishing in NY is still holding up though the numbers of fish still around are a lot less than earlier in June. The heat wave we are starting to have will shut that down save for early mornings or the 45 minute around dusk for the evening fishing. As for hatches, very little is happening save for some Caddis and the odd Blue wing Olive in the mornings. Have not been fishing evenings so I could not tell you whats been going on there. Thats all I have at this time..Pray for some noce rain and a break from this heat wave we are having. Well into our prime time fishing months for this season. Our weather from the last report has been blue bird days, cool evenings, and only little rain events on the 2nd. and 6th.. While many of my guests have loved the weather, our streams have reflected this with abnormaly low levels. For example, the Walloomsac has been flowing between 125 and 60 CFS which is well below the median flows of 200-150 CFS. Even though the rain on the 2nd.. and 6th., brought water levels up, they quickly dropped back to the low levels. Fishing in my stocked and mixed waters has been fairly good though overall the stocking in both NY and Vermont has been later than usual. This is not a bad thing and hopefully will spread out the fishing well into July. For my strictly wild trout fisheries, the low water has prevented me from fishing small water. The Kill and the Mettawee are fishing o.k. when I have targeted them. The hatches have been sporadic, but plenty of Caddis, March Browns are all but done and I am starting to see small Sulfers, and a Blue Wing Olive species that appears in mid-June. As I am writing this I am remembering todays guide with a very good friend and long time client. He had a banner day on the Trophy Stretch of the Sac. He even caught a couple using a two handed 6 weight Spey rod.! It was a good day. Tight lines and see you on the stream. Yes spring has arrived and now its quite summer like as I write this report. We went from cold/cool to some really nice weather for the rest of the month. Water levels were quite high back in the first week in May and then steadily dropped till the 20th of the month where a rain event on the 21st raised water levels a bit to again slowly fall to where they are as of today. For example, on 5th of May the Batten Kill was at 2000 CFS and now it has dropped to only 450 CFS, fairly low. The same trend appears for the Mettawee and the Walloomsac as well. For hatches, we are into the Light Cahills, March Browns and several species of Caddis. Evening spinner falls with appropriate weather have been good I hear on the Batten Kill. Small water had been fishing good till the low water of late. Its been a mixed bag as for the wild trout and even for the stockies. Both NY and VT are stocking later due to the late start of spring. They are catching up if you look at the reports. Thats all I have for now. Its prime time so get out to your local haunts. Finally spring is beginning to make an appearance and we can feel the heat of the sun. Since my last report we finally started to get our snow melt around the 22nd of April. All area streams rose to near bankfull for almost 10 days due to snow melt and some cold rain events. For example, the Walloomsac which was running at a good level (250-350CFS) rose to 1000-1500 CFS which made it unfishable. The same was true for the Batten Kill, Mettawee, and Otter Creek. As for the watersheds that are stocked, they are stocking with earnest now, but mostly doing the ponds and lakes. The trophy section of the Wallomsac was stocked on April 27th under high water conditions so that should help spread the fish out from the stock points. Later this week water levels there should finally be low enough to successfully fish the "Sac"
Will keep you posted as we go forward in May. The Vermont season opened last Saturday with weather and conditions more like mid-March and not mid-April. The Green Mtns. still have 1-2 feet of natural snow and our temperatures are in the mid-20's at night to day time highs in the upper thirties. Water levels are slightly high but the stream temps. are still only around 40 F'. Brrrr ! I have started to do some scouting, especially in small water to see how the winter has changed the sections or beats I target. I am concerned about Flower Brook especially after the flash flood that did so much damage in earlly July of last year. Will keep you posted on conditions as we get towards the end of the month. The rest of this week cold and snow flurries Yea !! The week away on the Jersey shore was great! Good weather and a well needed rest. While Pauline and I had nice weather at the beach, back in VT that week was very cool and 2-3 days of wind and rain made it seem like early fall. Rain events on September 4th. and the 6th.-7th., raised water levels to the 300-400 CFS for the Walloomsac (as an example) and since then have slowly dropped to what we have now in the 70-80 CFS range which is normal for this time of year. I am focusing my guiding on the Walloomsac/Hoosic drainage and the Batten Kill both in VT and NY. The Mettawee has been too low to effectively fish and I will wait to later in the fall when water levels improve. Water temps. in all area streams are in the upper 50's to low 60's which is excellent. As I write this we have had a string of beautiful bluebird days since 12th. No rain and only 1 or 2 days of cloud. I believe because of the bright days the fall hatches have been only so-so. In mornings, there are a few spots where Trico spinner falls are happening, but the timing is much later in the morning, say 9-100 a.m.. I am shifting my guiding to afternoons now and toward the evening looking for spinner falls as well as fresh hatching Duns. Fall Caddis, small Caddis and Blue Wing Olives are what I am seeing for bugs. I will keep you posted to conditions as we go toward the end of the month. Its been a very busy guiding season and now as I write this I am taking a much needed break on the Jersey shore with my wife Pauline. I guided till the 3rd. of September. For the second half of August conditions continued to be overall good with well placed rain events to keep water levels toward optimum and river temps. excellent for this time of year. The hatches overall have been fair to good depending on the watershed and the particular bug hatch. Rain events on the 19th. and 23rd. added to flows to keep levels at or near median flows. Using the Walloomsac as an example, river flows topped out at 600 CFS during the rain on the 19th to lower to 80 CFS on the 22nd. A small rain event on the 23rd., raised levels to 200 CFS only to return below 60 as the month ended and into the first days of September. Thes flows are some of the best we have had in several years. Both the Batten Kill and Mettawee had the rain events, their flows should similiar increases and drops though flow rates are differnt due to watershed size. River temps have been excellent throughout this period. All in the low 60's or even the high fifties on some mornings. Thats very good and shows in the way the fish are acting once hooked up. On another subject relating to flows I have been scouting and fishing the Mettawee below the junction of Flower Brook where back in July there was a flash flood in the Flower Brook watershed. I have not inspected Flower Brook. Downstream on the main-stem I am happy to report that the fish are there in OK numbers, water is clear (except after rain events) and the bug hatches are fair especially the Tricos. I will take time this month to inspect Flower brook to document the damage there. Hatches continue with Tricos and small Caddis in the morning. Some Blue Wing Olives during the day and I amd now seeing Isonychias in good numbers on the Batten Kill and the Mettawee. We should be seeing flying ants as I write this but I won't know until I return next week. Its finally Trico time with the bugs showing up in good nmbers on the Batten Kill, and the Mettawee. Even the Walloomsac is seeing some spinners and Duns. This bug is still recovering from the ravages Of Irene and post Irene on the "Sac". Since mid-July conditions still have continued to be good with above normal water levels and excellent water temps. This has been a better year than the last several.Water levels remained above median flows on all area watersheds till we got in the later part of July when we went ito a dry spell with virtually no rain. Water levles are now slightly below normal now but still in very good shape. What is more impressive is that river temps. have remained cooler than normal all season long, again good for the fish and good fo the fishing. Flows today are as follows: Batten Kill 200 CFS, the Walloomsac 80 CFS and the Mettawee 60 CFS.. Hatches are as I said in the opening statement, Tricos and the following small Blue Wing Olives (18's-20's) small Caddis 16's and I saw my first Isonychia on the NY side of the Mettawee today. Hatches are of course sporadic through the day. I am now getting some good dry fly fishing, the wild and stocked fish are wary and selective already. It seem there is more pressure, especially on the Walloomsac this summer, less so on the Batten Kill and the Mettawee. Canoe/Kyak traffic has been very large on weekends and not bad on weekdays. Ican't wait till after Labor Day when I can spend a lot of time on the Kill,Sptember/early October is a very good time to fish the Kill. Got to go and get ready for tomorrows trip. July 10th, 2017, Walloomsac River,VT. What a month it has been since my last report of mid June. We continued to get periodic rain and cool weather which has kept water temps. cooler than normal and above normal median flows for later June into July. Overall this has been a very good thing! Higher flows make for less spooky fish. For stocked fish, it allows them to spread throughout the river giving us areas to fish away from stock points. When the bigger waters like the Batten Kill or Walloomsac were too high, I targeted small water if I had the angler skill. Small water still is fishing well as of mid July due to the water levels. Rain evens on June 17th.,21st.,and 25th, and July 1st-2nd. all contributed to the above normal levels. On July 1st., localized severe thunderstorms cause flash flooding on 2 of my target watersheds. Flower Brook, a tributary to the Mettawee, and the Walloomsac in Bennington. Surprisingly, the flood on the Walloomsac did little damage and fishing continues to be excellent for mostly stocked yeerlings. In the case of the Mettawee, time will tell the impact of the flood on bug life and habitat. When Flower Brook flooded it scoured the stream bed and opened up clay deposits which turn the water a cement gray and reduce visability to almost nothing. It is beginning to clear now as I write this. I will keep you posted as the summer progresses. I have shifted to morning for the fishing time and our hatches are now in that transition time. That of evenings to mornings. Its our "in between time" though there are still bugs around. Small Caddis, Blue Wing Olives, and off course midges. Mid-day things are shutting down. Overall this spring the fishing has been on average much better than in the last 2 years. Better conditions produce better fishing. All indications this season should continue to be a good one. June 16th, 2017, small water in the rain. Had a day off today and all it did was shower and rain till the afternoon. This was a good excuse to knock out office and paper work that was getting away from me..Water levels have been excellent, this rain will just freshen it up. When I went out this afternoon to scout, one of my local waters had risen a little and had a slight mud stain but still quite clear. This should be a good time to nymph and see who was out for the feed. And they were, quite eager to get the fly!! Mostly Browns, 3 year classes, mostly 1 year olds though. I only sampled and many times not striking and letting them drop it, less spooky in near future. It felt so good to do some fishing myself. Since my last report in May we have continued to have conditions of cool weather and above normal precipitation. Our water levels today are excellent, but some days we had to be creative to find fishable water. Rain events on May 27th, 30th.,June 7th., and today have contributed to higher than normal waters. All in all very good conditions if you were mobile enough to fish small upland streams which would drop and clear quickly. Don't get me wrong I would rather have these conditions than the low waters of the last 2 years. This year on our stocked streams the fish spread out after stocking and had less pressure due to certain days conditions were unfishable. Also see less predators out and about again due to water conditions. River temps are excellent as well for mid June. We are getting fish either nymphing dead drift of where the water type is appropriate, wet fly swing. In small water we are mostly fishing drys unless water is up from a rain event. Bug hatches are March Browns, 2 species of Caddis, some Sulfers, and Blue Wing Olives in size 18. I have rarely guided till dark so I don't have a handle on spinner falls. Have a number of 1/2 day morning trips in the next 2 weeks, so I will go scout in the evening. Thats all I have for now, be sure to get out, fishing is good right now!! In just a short time from my last report a lot has happened as for fishing conditions and action. Rain events on the 5th.,8th., and 15th. raised water levels on many streams to unfishable levels for a day or two after the rains. All the watersheds I fish on are expierencing above normal levels for this time of year, It is a good thing though, allowing our stocked fish to spread out and not allow their natural predators easy prey. Stocking continues on both Veremont and NY streams. As of this date the Black has received 3 stocking and the Trophy stretch of the Walloomsac has gotten both its scheduled stockings. They have stocked both the Batten Kill and the Mettawee in NY. Bug hatches are beginning to come on strong as well. Light Cahills, several species of Caddis and Yellow Sally stoneflies. Most hatches have been inafternoons, especially on the cloudy and warmer days. Water temps. are now in the upper 50's and that is a great thing. Because of the higher than normal flows, my small water targets are really coming on with very cooperative wild fish. Here is where we have had some good dry fly action. Since my last report fishing continued to improve as water levels and temps were favorable to bug hatches. On this date most area streams are getting to normal early May levels unlike last year at this time when we had mid-summer low water levels. River stocking both in NY and VT are just getting going, a liitle behind schedule due to the higher water flows and cooler river temps. My small stream targets have been high and cold and till just recently were fishing poor due to these conditions. Now stream temps are approaching 50'F and I excpect an improvement therre. We are just about done with Hendricksons and Blue Quills. I saw my first Caddis flies today and we should start to see Light Cahills (May fly) and our Yellow Sally stoneflies. The New York fishing season opened on April 1st and Vermont's trout opener is Saturday the 8th. It will be an interesting opener with our temperatures below average for the beginning of April and the surrounding Mountains have just started their snow melt!!!! There is still a lot of snow above 1750 ft. elevation and the ski areas have plenty of base to get them to their season end in the next few weeks. I took some temperatures of area streams and most are still in the high 30's. In looking at flow data we got our first of the run-off on 28th. of March. With a a significant warm up starting next week we should see some serious water levels. Having the snow pack is great and if the melt is slow we will get a significant re-charge of area aquifers. Since the first of the year we are above normal precipitation wise and slightly warmer than normal temps, this is all good for the upcoming season. I will start guiding in late April if conditions allow. Sometimes its very good and sometimes the major watersheds are too high to fish and the tribs are still in winter mode. Every year is different. I'm away for the next few weeks, then return for scouting, and preparing for the 2017 season. Guided a good friend and long time client today on the trophy stretch of the Walloomsac. They did the 1st stocking of the 2 year olds, 500 total. The stretch will get a second stocking in Mid-May. Flows were good for stocking (approx. 250 CFS) which allows the fish to spread out from stock points. We caught some nice fish but had to work for them, only 1 maybe 2 in the usual spots. The rainbows are very nice in size and condition. All bodes well for the season ahead !!!! Since my last report we had our snow melt from the 8th to about the 20th of April. Area streams, while not at flood stage were very high, many times bank full. After the 20th, streams started to drop to more fishable levels with warm and dry weather helping the conditions. Water temps started to climb into mid-upper 40's and started to see some bugs around the 24th. of the month. Vermont has been stocking pond and lakes and is now shifting to river stockings. For the Trophy Trout areas, Otter Creek was stocked on the 19th., and the Walloomsac on the 24th. In NY, they generally stock the Kill the first week of May and the Mettawee around the second week of May. I have done little scouting in NY yet this spring. A review of water levels for this date shows the Battenkill at 800 CFS, the Walloomsac (250 CFS) and the Mettawee (275 CFS). All are getting into great levels for this time of year. The fishing should really turn oni n the next few weeks. September can be characterized as similar to August's warm and dry weather. And yes! even much lower than normal precipitation for this part of New England and eastern NY. Since I started fishing and guiding upon my return from vacation I have focused most on the Batten Kill watershed and only fishing the Walloomsac after rain events. The positive is water temps have cooled off to the lower to mid 60's which puts the fish out of a stress situation temperature wise. We still have very low water levels and as far as I can remember, I haven't fished in conditions such as this. Fishing has been only fair to very poor given these conditions. The fish are just too spooky and in the heavily fished Trophy area of the Walloomsac are "Jaded" from lots of pressure. Still there were some good days, again after rain events during the month. I always focus on the Kill in September and October and this is no exception this year with the low flows. Some days we catch and some days we don't. Success is definitely better when it's 1 angler and he has very good skill, definitely tougher for beginners. I started to shift to fishing afternoons from mornings back in August. This shift relates with the hatching activity during this month. For bugs I am seeing Isonychia, the smaller fall caddis and a few of the Autumn Sedge our October caddis. Hatches have been sporadic overall but where I have found rising fish, in most cases, (if there is a correct presentation), there will be a take. It's been so long since I have fished small water due to conditions. Forget the whole Mettawee watershed. Most of the Kill' upper basin is out due to the extremely low water. The exception is the Roaring branch which actually fishes well in low water. That has been productive fishing a caddis during the warmest part of day. That's all I have at this time from here. Tight Lines and yes pray for some rain!!! Just finished a morning fish here and lower down on the main stem with only little results overall. Since my July report the fishing has been getting tougher due to low and warm water conditions. While the weather has been great if you are at the beach, not so for trout fishing this summer. While we did have rain events on the 3rd,11th,14th,and 22nd of the month water levels only raised to near normal levels for a day or two before returning to very low levels (40-50% of normal!!!! ).With these water conditions it has eliminated some target streams namely the Mettawee which I never fished but for 1-2 days in early August. The water was too low and warm. I did not want to stress the fish under those conditions. I have been focusing on the Batten Kill and the Walloomsac watersheds for my guiding. As mentioned in the previous paragraph, there were some rain events spread through out the month and at those times the fishing did improve for a few days after the rain events, it seamed to "perk" the fish up. Hatches are principally limited to the morning Trico spinner falls and I also saw at times some small blue wing olives and tan caddis. With the exception of some places on the Kill, the hatch on the Sac has almost disappeared post "Irene" and has not recovered. I did have a couple of excellent spinner falls on the Hill Farm stretch. I use a 20-22 size spinner in early August and now at the end of the month 24"s are all they will take !!! As I look forward to September things should improve as nights get longer and temps. start to cool down. Usually we see an up tick in rain events and amounts per storm. We need both now. Lastly I will be taking a break from my guiding starting September 2nd till the 10th of the month. I'm heading to the beach for our annual week on LBI on the Jersey shore. It is a much needed rest and relax with my wife, a great place to recharge the batteries. Talk to you later in September. Fished on the Kill in a.m. today and was surprised to find quite a few Trico's about on the upper river. The hatch has started and appears to be a couple of weeks early like so many of our hatches this year. I also found some "tric's" on the Walloomsac yesterday near the park in the Henry stretch. Since my last report we have seen conditions become more and more difficult due to continued low water and 'blue bird" beautiful sunny days that have made the hatches tail off in evenings and things are just getting going for our morning hatches. Area rivers are still running 40-50 % of normal flows which has limited my targets to the bigger waters in our area, namely the Batten Kill, and sections of the Walloomsac. I haven't fished small water since the end of June, conditions are such with the low water that it is fruitless due to the spookiness of the trout. We have had some rain events, and for several days after the rain, conditions improve significantly with the temporary higher flows. Rain on the 2nd, 10th, and 15th brought streams to median levels or above but only for a short time. Water temps. on the Kill have been fine up till now staying in the upper 60's in the heat of day. The Walloomsac has been fine except I am not fishing the trophy stretch (Henry Bridge area) because water temps. were getting into the low-mid 70's at around noon. The river above the Papermill dam is staying cooler and the Roaring Branch ( upper Sac) is fine. I am exclusively fishing mornings now, the few evening trips I did were not productive at all save for those times right after a rain event or at about dusk for a short window of bug/trout activity. As I stated at the beginning of the report,I am finding Tricos, and in addition I am seeing Blue Wing Olives (size18-20's) and tan caddis (size 16) all early and by 11:00 a.m. its over and the fishing turns off. Thats all I have now and keep praying for rain! Today we fished a section of the Roaring Branch for wild Brook trout and did "just o.K." We did get a 12-13 " Brown trout that was real cool in such small water !!! I like to fish "the branch" when many of my other small stream targets are to low to fish. And, yes, this stream was low, especially for late June. Since my last report in earlier June, we had a good soaking rain event and good fishing from the 8th to around the 12th. Then the bright sun and warm/hot days made conditions harder and harder as the month progressed. We had no rain from the 6th, till just the other day the 27th., and not much at that. Flows in early month were near median levels for this time of year but continued to drop to very low summer levels. Using the Walloomsac as an example, median flow should be from 150 CFS trending to 100 CFS at months end. Actual flows have been in the 90 CFS trending to 50 CFS. That is summer time low!!!!! I have shifted to morning trips almost exclusively and the best fishing action is from 7:00 a.m.to around 11-12;00 noon. Mid month I did some evening trips to dusk on NY side of the Batten Kill. Right at dusk we had some hatching of Caddis and the "White Fly", a large cream to white may fly. I saw nothing for spinners. In the mornings there is not much for hatches save for some small Caddis (size 16) and the odd Blue Wing Olive (size 18). This is the transition time for hatches. The evening hatches are tailing off and our premier morning hatch, "Tricos" is still 2-3 weeks away. But it is the season to start fishing terrestrials ! Pray for some significant rain events in July, there are fish around, our best luck has been 2-3 days after it rains . Fishing was excellent today due to a rain event yesterday (June 5th) and water dropping and clearing to a good fishable flow.The "Sac" is a both wild and stocked fishery and the recent stocking produced very cooperative fish. Wolly Buggers and wet fly swing worked very well. It was a good day. Since my last report conditions have improved especially after rain events which raised waters to more near normal levels. Rain on May 24th, and June 6th resulted in good fishing a few day after these events. Flows have been: The Walloomsac flows of a high of 400 CFS, to a low just a few days ago of 80 CFS. That low flow is what we have in mid-August! The Mettawee and the Batten Kill have had similiar ranges and overall levels have been better than earlier in the year but still are way below the median. For the stocked fisheries, both in NY and VT, all stocking is pretty much done. The fish are bigger than usual (both yearling and 2 year olds) and greater fights as well. This is an excellent time of the season for beginners to learn and improve their hooking and playing "fish" skills. These same fish in a couple of weeks will be very hard to catch after being "educated". In our wild trout streams both small water and the Batten Kill are fishing better than last year. There was a period when small water was "on-fire" when flows were optimal. Good numbers of 1-2-3 year olds is a very good sign for the health of our wild fish. For Bugs, we are all done with Hendricksons, and the Light Cahills are waning as well. Plenty of Caddis hatches in the morning around 10:00 a.m. and on cloudy rainy days bugs are definitely more plentiful. That's all I have at this time and enjoy the nice weather of late. However pray for rain to keep conditions in the good category. We are a month into the season since the trout opener in April. What started out as an early spring following a mild winter, the later part of April and early May were cool and below normal temps. Spring definitely slowed down till just the last few days. Our water conditions have been excellent for this time of year due to the below normal precipitation this spring. Median flows in most streams have been 60% of normal till just lately. Rain events on 4/24, 5, 2, and 5/6 have brought water levels up but only unfishable for a day after the rain. All good ! While I have done some trips since the opener I have had some time to fish and scout myself. Also I have been getting caught up on projects at home which once the season gets going I will not have any time to do. I did have a great afternoon in the lower NY Kill 3rd week in April where I was fishing an area that was one of my primary haunts as a kid. Hendricksons and Blue Quills were coming off sporadically and only the rare splashy rise. I decided to first go through swinging a Hendrickson nymph and olive caddis trailer. Several good pulls and a nice hook up with a 16-17 Brown, however he shook off after a minute. This was repeated again further down and this fish I landed, a beautiful 19 inch female. This stretch is far away from stock points and rarely holds stockies. This was true 50 years ago and is the same today. Took a break and just sat waiting for the surface to get more active but the three fish I saw earlier I hooked 2. Decided to make one more pass, this time fishing a streamer. No pulls or hits till I got almost half way down (this is a big pool). I knew immediately that this was a big fish by the Kill standards. A couple of head shakes deep and then off to the races down the pool once into the backing. I was sure glad I ws fishing 1X tippet. After 10-15 minutes he was beginning to tire but still a bottom hugger. Finally I got him on top on his side and sliding toward the net, only to have the hook pull within a foot of the net. A beautiful Hooked Jaw male, definitely in the 26 "+ range. It was great !!!! Back to the report. Stream stocking really picked up the last week of April and first week of May. In VT the Wallomsac got its first stocking in the trophy stretch on the 25th April and yearlings on the May 6th. The Black got 500 Rainbows in the Trophy Stretch the first week of May. As of 10th of May the Kill and Mettawee in NY have been both been stocked. We are pretty much done with Hendricksons and I am just starting to see Cahills and more and more caddis. This evening I was fishing small water near home and around 7:00 pm there wer tons of spinners mostly from Blue Quills and a few Hendricksons. It was so neat just to observe. I was successful on the only rising fish where this was happening. Thats all I have at this time. See you a-stream! end of March and they were in the mid to upper forties and dropped to high thirties for the opener. Rain events on the 8th and 11th raised water levels on area streams to unfishable levels. The Batten Kill rose to over 2000+ CFS, the Walloomsac to over 1000 CFS and the Mettawee in NY to over 750 CFS. Water levels have dropped significantly to excellent levels as I write this report. Temps. are in the upper forties to over 50' F at the warmest part of the day. Bug hatches are just beginning. I am seeing Hendrickson, Blue Quills and small black stone flies. The bright sun shiny days are helping and this next week to two, the hatch should be in full swing. 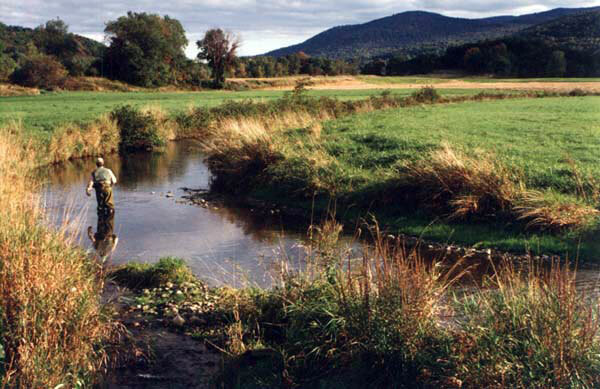 Stocking of area streams both in NY and VT are still yet to be started. Otter Creek in danby recieved the first stocking of Trophy trout today which I will check out tomorrow. The Black will get the first stocking, the week of may 1st, the Walloomsac has not listed stock dates (which is probably a good thing). I have done a few trips to date, mostly Instructional with limited fish catching. That should improve as we get closer to May 1st. Its "Spring Forward Day" with the clock change this morning. Longer days, stronger sun, and thoughts and plans for the upcoming season are on my mind this morning. Usually at this time I am busy finishing my winter job in the ski industry and madly getting ready to head to Michigan for the spring Steelhead season. This will be the second year I will not be going west and concentrating my guiding on the local waters of southern VT and nearby NY. What a winter!! Or should I say a "non-winter"!!! Virtually no snow, wide temperature swings, and many days above freezing all culminating in the warmest winter on record for my home state of Vermont!!! As I write this report there is no snow cover and our temps have been averaging 15-20 F above normal Usually when the fishing season opens (early April) ours streams are high and cold from snow melt so our hatches and spring fishing doesn't get going till early May. NOT THIS YEAR, IT WILL BE UNUSUALLY EARLY DUE TO THESE RECENT CLIMATIC CONDITIONS. The local ski areas will close soon and I will have plenty of time to prep, tie flies, and work on my small water targets, walking/scouting and pruning that critical branch to get a good cast in a tight spot. Our NY Trout season opens April 1st and VT opens on the 10th of the month. Looking at the 30-60 Temperature and Precipitation forecast/Prediction, it looks like temps will be above normal and precipitation normal or slightly above normal. Given this and my instincts, I WILL BE ACTIVELY TRYING TO BOOK TRIPS FROM THE 15TH OF APRIL ON!!!!! Three weeks earlier than usual. I don't predict higher spring flows so we should see good Hendrickson/Red Quill hatches in the NY Kill much earlier than usual. I feel my early season fishing will be much better than in years past. If interested in that later part of April contact me to get on the calendar for that time frame. Its not often we get this (I can think of only once or twice) early season opportunity. I will start actively walking my small water streams this week and keep you posted as to what I am finding from the stream and conditions.